The beautiful ITALY is our next stop in Magical Scraps Galore's "Best of" travel collection. In traditional Italian colors and overflowing with themed elements, the BEST OF ITALY collection includes icons such as the Colosseum, the Tower of Pisa, St Mark's Campanile, a traditional gondola, a Vespa scooter, a Venetian mask, iconic Italian food like spaghetti & meatballs and pizza, a Chianti bottle among many other fabulous goodies and patterns. 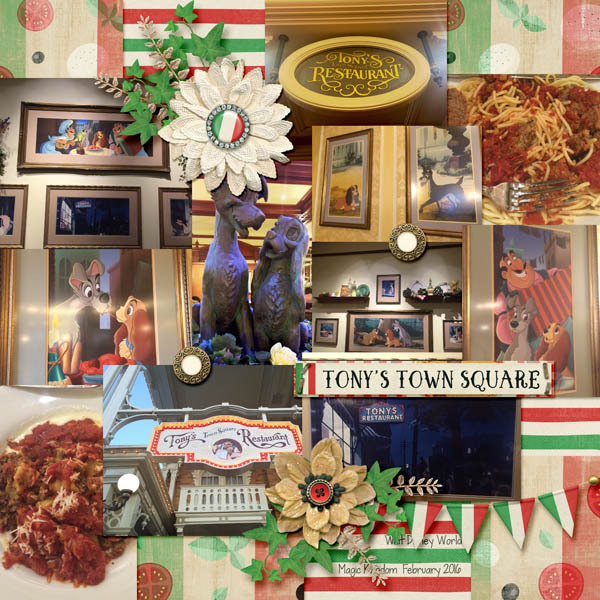 This is the perfect collection to add some Italian flavor to your layouts, whether you are visiting Italy or the Italian pavilion at Epcot, documenting your Italian heritage, scrapping pizza night or your favorite Italian ristorante, to name just a few! Find the full collection at 58% off -or the individual page kit and four add-ons at 30% off through November 14th at GingerScraps and The Digichick. This week we have 2 beautiful clusters created by CT members Lisa and Karrie, using the Best of Italy collection. Visit Marina's blog HERE to download and enjoy! Stay tuned for Marina's new collection coming to stores later this month!